It's been a long time since I wrote a City Walk post! Probably because it's been months since it was warm enough to go on a City Walk. We recently saw 85 degrees here in Chicago though, so Alex and I took the opportunity to get out and enjoy the sunshine before the spring chill crept back in. This time around we decided to take a walk through Lincoln Park, one of Chicago's cutest (and priciest) neighborhoods. Lincoln Park is a great family neighborhood and it is home to the zoo, DePaul University, great local restaurants, cute shopping, and it's namesake: Lincoln Park. 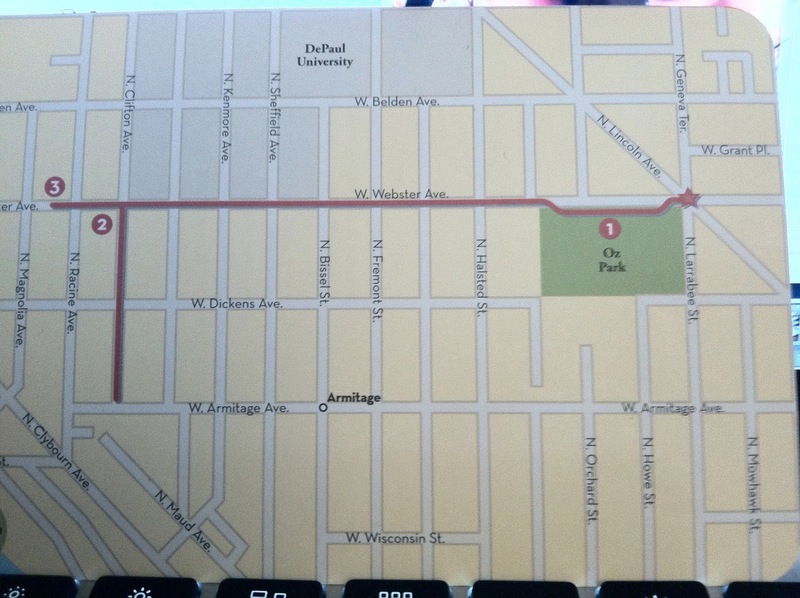 We began this Walk at Oz Park , just south of aforementioned DePaul University. As you may have suspected, the park is named after the famous book The Wizard Of Oz. Author of the book Frank L. Baum once lived nearby in this neighborhood and this park is a really fun tribute to him and his most famous work. The park includes a yellow brick road and a gated garden named for the Emerald City, but the highlight-- or rather, highlights-- of Oz Park are the story's 4 main characters that mark the entrances of the park. And Dorothy and Toto too! Alex made a new furry friend along the way too. After our walk through Oz Park we continued down W. Webster Ave. for several blocks. It's a really pretty part of Lincoln Park that I don't get to all that often since it is a little more residential. We took a little detour (per the directions on the Walk card) down N. Clifton to check out some of the beautiful flowers in the Sheffield Garden District. These people take their landscaping seriously and as a result, the whole street is just really lovely. We walked back up to Webster Ave. for the home stretch of the walk and our next stop the Left Bank . I've never been to the Left Bank before, but am very familiar with the name as Alex and I used to live in a building downtown also called Left Bank... every time I Googled our building to find their phone number I came across this one and was always curious about it. As it turns out, the Left Bank is a cute little Parisian-inspired boutique that sells jewelery, accessories, and unique gifts. The end point of the walk was just diagonally across the street from the Left Bank: John's Place  on Webster between Magnolia and Racine. It's an adorable little neighborhood cafe with lots of great outdoor seating. We would have stopped in for a bite, but I had promised Alex that we'd try Butcher & the Burger for lunch that day. We did and I'll be giving you the lowdown on that meal in a later post. Spoiler alert: Yum!